For years, the 1 oz. Gold Maple Leaf (GML) bullion coin has been known as the purest investment coin in the world. Purchasing a Gold Maple Leaf is universally known as the most profitable way of investing capital in gold with a fineness of 9999, without VAT and with virtually no overhead charge. Gold Maple Leaf bullion coins have also been famous for the continuity of their design over many years. This however changed in 2013 when the Royal Canadian Mint surprised the bullion industry by modernizing the design of its 1 oz. Gold Maple Leaf coin. Since then, the reverse of the GML has contained an additional feature: a miniature laser- engraved maple leaf inside of which can be found the 1st two digits of the year of issue. The Royal Canadian Mint introduced this innovation as an effective anti-counterfeiting measure which helps make the GML the world’s most secure gold bullion coin. In spite of the rapid development of 3D-printing technologies, the Canadians are absolutely right and leading the bullion industry in this increasingly critical area. As these new coins start to change hands, it is important to remember that their security does not diminish with their appearance. Anyone who rubs the reverse of a 2013 or subsequently-dated GML can darken the micro-engraved maple leaf security mark. Any person versed in coins is inclined to think, after a brief examination: «This coin isn't new anymore, it has been rubbed with cloth». They would be right since any fabric touching this laser engraving is bound to leaves trace particles inside. The cloth can thus reduce the coin’s natural glitter and make it look darker. No cleaning (including ultrasonic cleaning) will ever make it as shiny as before. If you used synthetic cloth, then you might be able to restore the coin's original appearance if you use an ultrasonic bath, filled with acetone or dissolvent, and wash the coin with spirit afterwards. However, if you rub the coin with natural cloth, it will remain darkened forever. A bake out won't help you either. Some people recommend «bombarding» the gold with cyanide and hydrogen dioxide, but there is no guarantee of success, so we won't even consider it. Furthermore, such chemicals require special training, safety equipment and a properly equipped work space, not to mention a license to handle any kind of hazardous material. You also have to consider that this kind of cleaning method will reduce the coin’s weight which, as the Mint confirms, will no longer match official engineering specifications. However, a GML with some darkened features still has its benefits and advantages. The point is that if you buy a Gold Maple Leaf, you purchase more than a simple coin. Instead, you purchase a coin-shaped Troy ounce (31.1 gr.) of gold with a fineness of 9999, without VAT and for the most beneficial price, available at the moment of transaction as the price of a GML is limited to the actual price of gold plus a minimal surcharge for the mintage and insured shipping of the coin. Thrifty and practical Germans understand that when they buy a Gold Maple Leaf they rather purchase a coin-shaped piece of gold than a coin, so they are often content to buy older GMLs, even if they have scratches and attritions. A 10-15 Euro discount per ounce makes such transactions very attractive for economical German people. Now let's get back to The Royal Canadian Mint. 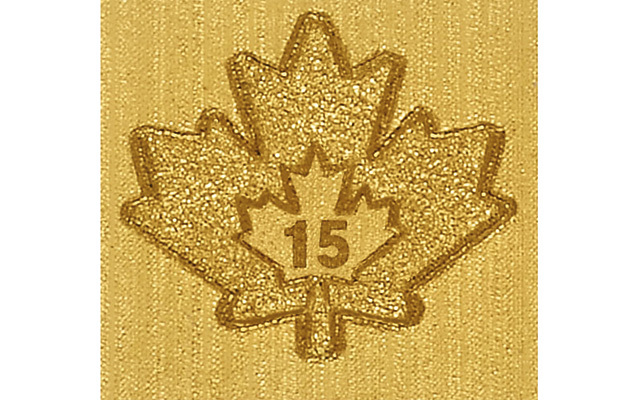 After the design update of 2013 few expected the Gold Maple Leaf to undergo more dramatic changes but in 2015, surprised investors again with finely engraved radial lines covering the reverse field. Forming a longitudinal grid, they refract light in a way that makes these straight lines look pretty much like watermarks on modern banknotes. It is purely an optical effect which makes the radial lines look wavy. The field on traditional GMLs used to have a subtle paper-lined texture but since 2015, these coins have been shining like diamonds, due to their dazzling array of of thin lines. They always reflect light, no matter what angle you look at the coin. It makes the new-generation GML coin more attractive, even for the people that did not use to pay much attention to its design. It is impressive that the Royal Canadian Mint still manages to release some of the most reasonably-priced 1 oz gold bullion coins in the world, while incorporating so much complex technology. The «Call of the Wild» series coins are another example of the Royal Canadian Mint’s innovation. These coins have an incredibly high fineness of 999.99, unmatched by any other bullion producer, and guaranteed by the Canadian government. They are released in presentable black vacuum-sealed cards and, this extra quality packaging and its contents give the Mint a very unique calling card in the highly competitive bullion market.. The Mint maintains Canadian leadership on the market and makes Canadian gold coins suitable perfect present for those who have everything and may be hard to impress. These top-class 5-9s gold coins are especially precious to customers, compared to ordinary investment coins like the American Eagle or the Chinese Panda. What else is there to add? We can only express our deepest respect for The Royal Canadian Mintage and the Canadian government and admire their remarkable achievements in refining and coinage, as well as the leading position on the market. Our materials can only be used in print and online media if a direct link to our Web-site is provided.